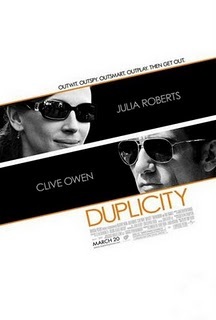 Duplicity is one of those films where you really have to pay attention. If your brain goes haywire for even the slightest bit, chances are you will miss something vital to the story. Well, on my screening day, I had gotten up early, been busy all day with classes and homework and I had already sat through I Love You, Man so I could tell all of my faithful readers (all three of you) whether or not they should plop down some cash for it. (Read that review here.) Plus, I saw the midnight screening of this and was beyond tired. Now here it is, three days later and I'm just getting around to writing this review, much to my detriment. I couldn't comprehend what I had seen directly after the movie was over and I'm afraid I'm even more perplexed right now. The story follows two spies (Julia Roberts and Clive Owen) who try to con a couple of corporations and steal plans for a new medical advancement that promises riches beyond belief. I grasped that much at least and really, it's all you need to understand to enjoy this film as I did. My brain may not have been on board for its entirety, yet I'm recommending it due to strong performances, some good humor and an interesting twist. Still, that doesn't mean I'm giving a total pass to the narrative's many baffling turns. The simple fact of the matter is that Duplicity is a bit too confusing, although the ending justifies it in a way. I won't give it away, but the ending has a great reveal that shows that even some of the characters didn't fully understand what was going on, so in a sense, it mimics the way we're watching the film. With that said, this is no Syriana and an easier to follow story would have been a great help. It's supposed to be a funny, fun, romantic spy movie, but its jumbled narrative didn't accommodate its style. The film is directed by Tony Gilroy, the man behind one of the best films of 2007, Michael Clayton. While many thought that was confusing, I found it perfectly easy to follow, and it's much more interesting than this. This movie jumped from year to year, month to month, and place to place constantly. There were times when I wasn't sure whether I was watching a flashback or not. Again, my brain may not have been operating at 100%, but regardless, this was too much. There's something to be said for simplicity in film. However, the story isn't necessarily bad. I don't want to give off that impression. Despite its complications, it's rather fun, mainly due to excellent performances by Clive Owen and Julia Roberts. As always, Owen is the man, full of charisma and charm. He can play it serious, as seen in Children of Men, over the top, as is the case with Shoot 'Em Up, or lighthearted and comedic, as seen here. The man is multi-talented and all of it shines through. His chemistry with Roberts is hands down the best so far this year and the two deserve some serious respect. Tony Gilroy may have written this film a little too confusingly, but his direction is masterful. He gives us some beautiful shots and approached the overall film with style, but knew when to tone it down and keep it simple. It was fantastic. So is Duplicity worth seeing? Despite its overly complex story, everything comes together so smoothly that it's difficult to not recommend. With great performances, excellent direction and terrific humor, including a slow motion fight between Paul Giamatti and Tom Wilkinson (which is among the best moments of the year so far), Duplicity exceeds above and beyond what its mediocre trailer suggests. It's no Michael Clayton, but then again, what is?